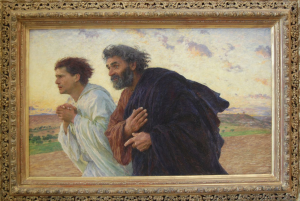 Above is one of my all time favorite paintings — Peter and John running to the empty tomb by Eugene Burnand. Was Jesus crucified naked or covered? I will be on 13 radio shows this week doing “A Virtual Tour of Passion Week,” “People at the Foot of the Cross,” “People at the Empty Tomb, “The Enemies of Jesus, ” “What Was it Like in Jerusalem” and more. See my schedule on my homepage. The shows are Catholic Answers Live, The Terry & Jesse Show, Al Kresta Show, Teresa Tomeo’s Catholic Connection, Sonrise Morning Show, Drew Mariani on Relevant Radio and every morning on Morning Air on Relevant Radio.